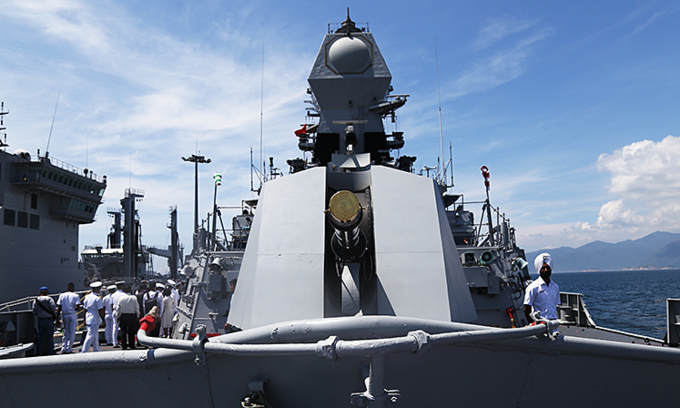 An Indian destroyer and a logistics vessel began a four-day visit to Vietnam Saturday en route to China. Stealth guided-missile destroyer INS Kolkata and fuel and logistics tanker INS Shakti docked at the Cam Ranh Port in the central province of Khanh Hoa. Led by Colonel Hara Aditya, the vessels have 730 officers and sailors on board. The visit aims to strengthen the friendly relations between the militaries and navies of both countries, promoting comprehensive bilateral cooperation, Aditya said. INS Kolkata, 163 meters long and 17.7 meters wide, is equipped with modern weapons and radar systems. INS Shakti, 175 meters long and 25 meters wide, has a loading capacity of 27,500 tons. During their stay, the Indian naval crew will play a few friendly games and exchange naval skills with their Vietnamese counterparts. They will also visit the resort town of Nha Trang. After their Vietnam visit, the two ships will sail to China to join an international fleet review held to celebrate the 70th anniversary of the People’s Liberation Army Navy on April 23. Two Vietnamese frigates will also participate in the event.